R ead Genesis 37:18-24 They saw him from afar, and before he came near to them they conspired against him to kill him. They said to one another, “Here comes this dreamer. Come now, let us kill him and throw him into one of the pits. Then we will say that a fierce animal has devoured him, and we will see what will become of his dreams.” But when Reuben heard it, he rescued him out of their hands, saying, “Let us not take his life.” And Reuben said to them, “Shed no blood; throw him into this pit here in the wilderness, but do not lay a hand on him”—that he might rescue him out of their hand to restore him to his father. So when Joseph came to his brothers, they stripped him of his robe, the robe of many colors that he wore. And they took him and threw him into a pit. The pit was empty; there was no water in it. Let’s face it. 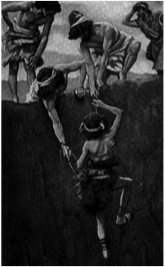 We have all been in the pit at one time or another in our life. When things are going as we expected, we don’t give much thought to God because we don’t need anything. It is only when we find ourselves having a pit experience and have no where else to turn that we call out to the only One who can really change the situation—God Himself. Joseph had lived a life of ease as the favorite son of his father. Because of this, Joseph’s brothers were jealous to the point of hatred toward him and plotted to kill him. Perhaps Joseph had a prideful attitude and maybe he had even been a spoiled brat. Perhaps his countenance gave the look of someone who thought he was better than the others. He had everything his heart desired except the respect and love of his brothers. But now…there in that cold dark place at the bottom of the pit, Joseph would have to take the time to reflect on his short life. It was time for him to realize that just because his father, grandfather and great grandfather knew God in a personal way it did not mean Joseph had the same relationship. In this place at this specific time would be the place where Joseph must examine his own life. No one else was there to show him what to do…except God Himself. Salvation is personal. Your ancestors, your parents, your siblings, your friends can not save you. Only Jesus Christ by the power of His sacrifice on the cross can save you from sin and hell to eternal life in His presence. Joseph found God. And God and Joseph began a personal relationship. Yahweh would see Joseph through the coming months and years to a specific place and task He had planned for Joseph’s life before the beginning of time. Joseph could not survive to the fulfillment of God’s plan without the divine presence of God Almighty. And neither can we. Have you been raised in a Christian home where your parents knew Jesus? Do you have grandparents who love the Lord or friends that love him too? What about you? Is He your Savior and do you have a personal relationship with Him? Have you met Jesus? f the answer is no, what will it take to your attention?